The Wolfriders of Stormrise have always bonded with elves, until the changing of the Way. Now, some of the elves have bonded with the great griffins of the northern mountains. Below are details of the bond beasts of Stormrise. 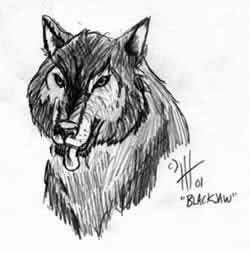 The wolves which bond with the Wolfriders of Stormrise are decendants of the Hunt, the elf-wolf mix fathered by Timmorn Yellow Eyes. The wolves are led by an alpha wolf; a wolf who has shown himself as the strongest of the pack. However, the pack hierarchy is by no way stable. A wolf of a lesser rank may challenge the alpha wolf at any time if it thinks it is stronger than the alpha wolf. Wolves of the pack hunt in a group, often using complex tactics to fell even the largest of prey. The wolves usually den near the camps of their Wolfrider bonds--the forest in the new green and the caves in the White Cold. The griffins of Stormrise used to be regarded as fearful, hostile creatures by both elves and humans alike. With the head, wings, and forelegs of an eagle and the hindquarters of a lion, the griffins are Masters of both land and the air of Stormrise. Griffins of Stormrise tend to have eagle halves of either bald or golden eagles. The griffins use both surprise tactics and stealth to fell their prey (which can be quite large in size). They also tend to have long life spans and can live to be over 1000 years old. Since Wren's "Spirit Walk," the griffins of the north have a symbiotic relationship with the elves, giving the four-fingers new advantages in the hunt (and perhaps in war). Griffins tend to be solitary, although they do have a loose heirarchy that is much more static than that of a wolf. It could be descriptively called a "monarchy". This "monarchy" undergoes changes only when a griffin falls victim to old age, great sickness, or death. Monarchs are always treated with an air of respect. Griffins are hatched from an egg laid by a parent griffin. Because griffins are so long-lived, mating doesn't occur often (perhaps once every ten years or so). However, female griffins tend to lay an egg (regardless of whether or not it's fertilized), once every two years. The eggs are laid in spring, and tend to be light tan in color. Some may be speckled. The eggs usually average 12" in length and half that size in diameter. If the lain egg has been fertilized, a young griffn hatches from the egg in three to four weeks. Immature griffins stay close to their mothers for the first five years of its life. Griffins are quite intelligent and speak competently with the elves via sends. The do have a strange way of referring to themselves in sending, however. 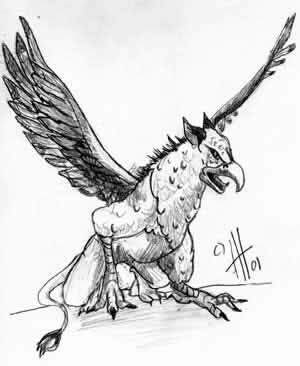 Griffins refer to themselves as "This one," another griffin as "that one," and a group of griffins as "other ones." Because this can be quite confusing to an elf, a griffin also might include a mental image of the other griffin's elf bond or of the griffin as a reference point. The griffins usually nest in the mountains to the north, but also nest in a clearing of the forest when the elves live at their New Green Hurst. The elves who have bonded with the griffins seem to have done so following the deaths of close wolf-bonds. Griffins also do not tend to bond with elves before the age of 100 (when they reach maturity).